Francis Joseph Jennings was born on 9 January 1894 at Somerville, Middlesex County, Massachusetts.1 He was the son of Michael Edmond Jennings and Ellen Frances McGovern. Francis Joseph Jennings was christened on 14 January 1894 at St. Catherine's Church, Somerville, Middlesex County, Massachusetts. He was Roman Catholic. Francis Joseph Jennings was usually known as Frank J. Jennings. Francis Joseph Jennings was listed as the son of Michael Edmond Jennings on the 1910 census on 18 April 1910 at 27 School Street, Waltham, Middlesex County, Massachusetts.3 Francis Joseph Jennings was a mechanic at MacGregor's Garage in 1917 at Waltham, Middlesex County, Massachusetts. He registered for the draft on 5 June 1917 at Waltham, Middlesex County, Massachusetts. 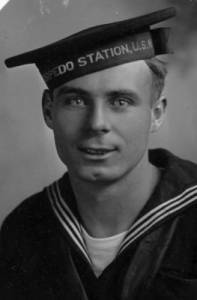 Francis Joseph Jennings began military service on 23 November 1917 at Naval Torpedo Station, Newport, Newport County, Rhode Island, in The United States Navy. He was an Aviation Machinist Mate in 1920. He was a Chief Petty Officer between 1920 and 1922. He ended military service on 22 November 1922; honorably discharged aboard the USS Langley. Francis Joseph Jennings died on 17 November 1931 at Anderson's Infirmary, Meridian, Lauderdale County, Mississippi, at age 37; Peritonitis. He was buried on 20 November 1931 at Mount Olivet Cemetery, 1300 Bladensburg Road NE, Washington, District of Columbia. [S11] Unknown document; unknown film. [S276] 1900 U.S. census, Middlesex County, Massachusetts, population schedule, City of Somerville, ward 6, ED 953, sheet 14A, 193 (stamped), dwelling 255, family 329, Michael E. Jennings. [S277] 1910 U.S. census, Middlesex County, Massachusetts, population schedule, City of Waltham, ward 2, ED 1041, sheet 5A, 56 (stamped), dwelling 105, family 101, Michael E. Jennings. [S34] Certificate, Francis Joseph Jennings and Catherine Florence Hans marriage of 26 Dec 1925, Volume "Oct 1919-Dec 1936" Page "38." [S98] Unknown record type, Washington, D.C.